Below are screenshots of President Indira Samarasekera’s official answers to questions posed by Arts representatives to the General Faculties Council for Monday’s meeting of that body. A pdf of the answers is here. I welcome responses to the questions and President Samarasekera’s answers — especially from those able to respond before the start-time of Monday’s meeting, 2 pm. 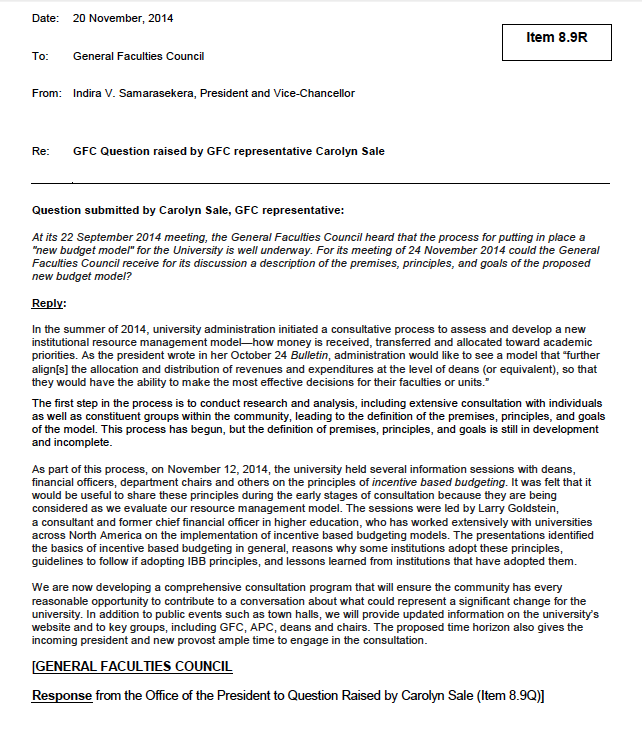 The “square” here is open to anyone who wishes to engage in discussion of how Canada’s public universities are run. 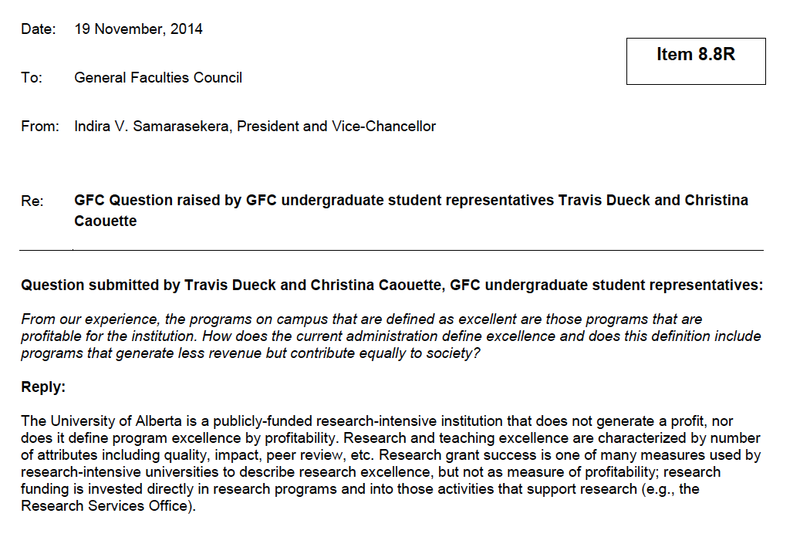 This entry was posted in University of Alberta Compensation Negotiations 2012 and tagged "excellence", christina caouette ualberta, indira samarasekera, public universities canada, travis dueck ualberta, ualberta general faculties council, university budget practices. Bookmark the permalink. To be clear, I have not been able to parse Mr. Goldstein’s CV to see whether his time at the U of Louisville ended before the processes described above began; perhaps he was not involved in any of them. My quick reading is that he left just as they took off, which could mean he got them started or could mean he had nothing at all to do with them. Toward the end of last year, GFC played audience to a presentation about “attributes and competencies” in higher ed; in Arts, at least, the BA is being retooled around a similar set of notions figured as unambiguous and innocuous goods (are YOU opposed to “attributes” and “competencies” and would YOU wish to stand in the way of students having either? what about free puppies?). In fact they have a specific money trail behind them of which it is quite illuminating to be aware. A Marxist might ask whether this table’s wondrous feats including its dancing on its head. My daughters went to university at Penn State in the mid 2000s. I was astounded to learn that even in fourth year they were evaluated based on how well they did on multiple choice exams (the Scantron is a professor’s best friend). Now I find out that the Gates Foundation wants to “modernize” post-secondary education by eliminating the middle man (the professor), eliminating credit hours and assessing proficiency on the basis of “tasks” delivered in the form of power point presentations. And this is a good idea because it allows low income students to attend universities. Then I read the article about Kean University’s $219,000 conference table. What can I say? I want that free puppy.